Kombatan Arnis is a complete system of hand to hand and weapon combat incorporating empty hand moves based upon the same motions used in weapon fighting. The weapon is just an extension of the hand. This modern system embodies all the different martial arts, emphasizing to react instinctively encouraging one to develop their own style of techniques. It is called “an art within an art”, that puts it all together! It supplements most other styles by learning to understand ‘the flow’. The flow is where the body and weapon movement blend to achieve one’s most natural individual full-range of fighting- kicking, punching, trapping and grappling range. The system is based around 12 angles of attack on the human body and 12 basic ways of dealing with each angle by hand, foot or various weapons. MDW – Born of combat on the violent streets of South Africa, the MDW Training Methodology provides an environment and a framework to effectively navigate the Chaos of Combat. The Framework provides an understanding of all the Dimensions that are required to survive, engage and dictate general and specific challenges that we may face in a violent attack. The MDW Methodology and Framework provides context and a matrix to bring together elements of the key dimensions of combat. Training is blade focused but incorporates extensive close quarter firearm, empty hand and improvised weapons, almost anything that can be used to save your life in the face of a violent attack. A PROUD HERITAGE OF COMBATIVE INNOVATION BASED ON THE FUNDAMENTAL ROOTS OF FILIPINO KOMBATAN ARNIS & LINKED TO THE PROVEN FUNCTIONAL METHODOLOGY OF MULTI DIMENSIONAL WARRIORS (MDW). 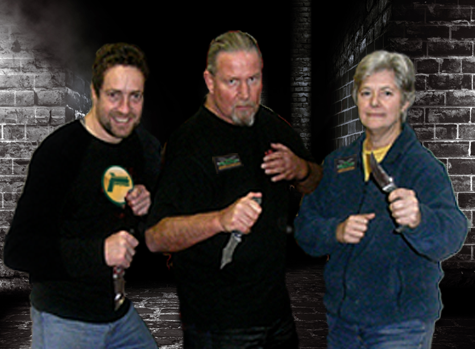 ENCOMPASSING ALL THE DIMENSIONS OF EMPTY HAND FIGHTING, IMPACT WEAPONS & EDGED WEAPONS. Kali 3 Dimensional evolved from the original roots of Filipino Kombatan Arnis Presas Style, incorporated with a slight mix of other FMA styles and Martial Arts. I realized that a lot of technique applications were only useful for cultural or demonstrative purposes, but would fail if applied under real pressure of an attack or in execution. Wanting to find reality, I started researching predominately edged weapons training & survival due to the blade being the most complex & intricate weapon to survive against. It was discovering initially AMOK! now Multi-Dimensional Warriors (MDW) many years ago that I found my combative truth. Truth can only be imparted by facts! MDW was the functional proof of the framework required of what, why & how to apply Kali in reality & to make it functional, not just a set of flowing movements against a stationary attacker that is most often demonstrated. After many years teaching as Kombatan Australia, I decided to formulate by own Global organisation of Kombatan Combatives International (KCI) due to being a completely different methodology to Kombatan & it’s practitioners around the world. Finally, convinced even further by others internationally the fact that my teachings being so different, that even the name Kombatan should be changed due to the Combatives of my MDW training & teachings. I also felt that it was extremely important to acknowledge MDW just as much as it was the essential important link that functionalized my Kali. When you have trained in hard Combatives for many years, you can’t mentally train as a “Martial Artist” anymore. Combat & Martial Arts are vastly different by nature, application & more importantly by result! 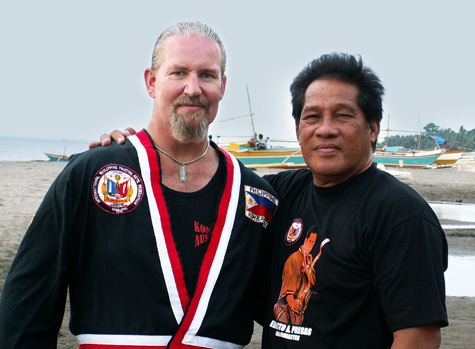 I will always recognize that I come from Kombatan Presas Style & would like to think that it is now being propagated more closely to the originally intended warrior mode of GGM Presas’s early days of his 21 challenge fights throughout the Philippines that he proudly told me about. 3D SYMBOL = based on the Om/Aum symbol, influenced from India where the original Filipino Baybayin script is an ancient script derived from Brahmic scripts of India & first recorded in the 16th century. It continued to be used during the Spanish colonization. It is also a symbol of the entirety of “consciousness, sound & energy of the universe.” Linked to humans (all races) are universally designed that establishes fundamental anatomical principles of being subject to vulnerability shared by all. KARAMBIT = well known curved claw shaped blade common in Filipino weapons. Om link, the curve of the blade represents an open mind to achieve a level of absolute consciousness. The dot represents absolute consciousness; fully aware of yourself & surroundings. RISING SUN = ever constantly evolving & growing, out of the blue sky (Nobility) from the red land (Blood of warriors in the battlefield). Golden Yellow (Freedom) sun’s rays make up the colours of the Philippines flag & the three stars represent the areas of the Philippines.